My favourite thing after beading? Teaching. 🙂 I enjoy sharing what I’ve learned with others, whether it’s their first venture into the world of beads or they’re already hooked and want to learn more. The first class this fall included 8 gals and a bunch of beads. By the end of the evening each person was wearing a gorgeous pendant of Swarovksi crystals. Talk about bling! Several other classes followed over the coming weeks featuring bracelets, earrings and more pendants. Great fun. In addition to public classes I also offer private sessions, both individual and small group. You pick the project and I bring the class to you. The minimum size is 3 people, the maximum is 6 or 8, depending on the project. I’m working on a number of new classes and once they’re ready I’ll post them here. 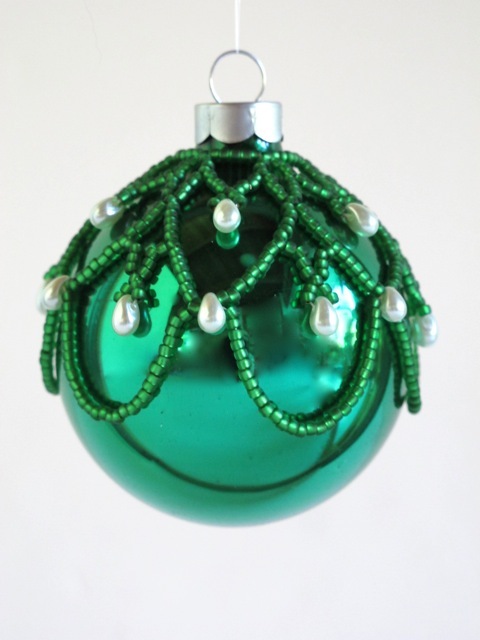 Categories: Events | Tags: beaders, beading class, pendant, Swarovski | Permalink. Colour is a fascinating aspect of jewelry making. The more I work with colour the more intrigued I am by how seemingly small changes can create such incredible differences. Take these 2 bracelets — both are done using the same stitch but I reversed the placement of the colours in the second one. Which is better? It depends on who you ask. Some pick one combination, some the other. What’s important to remember is that colour placement does matter. Examples like these are helpful when I teach beading classes. Beginning beaders often have trouble imagining what two or more colours might look like. Being able to actually hold variations in their hands lets them see how their choices will affect the outcome. 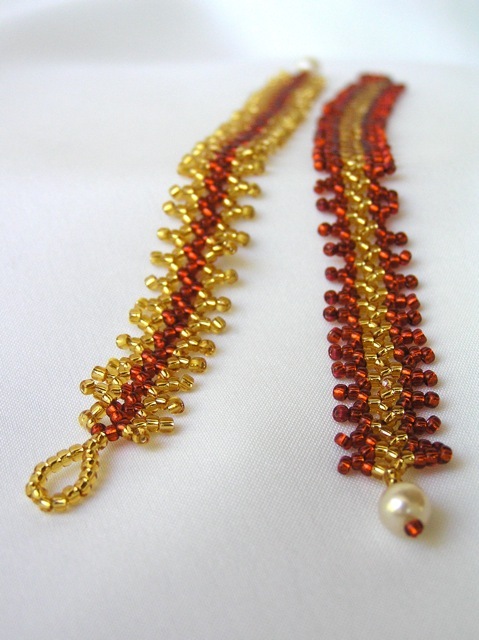 Categories: Handcrafted Jewelry | Tags: beading class, beadweaving, clasp, colour | Permalink. The kits are assembled, the tote box is packed and I’m ready to go! I’m teaching a beginners’ beading class at the Sundre Library tonight. We’ll be making bracelets using 2-needle right angle weave. I had a lot of fun putting the kits together — they’re so pretty I wanted to bead them up on the spot. I did make up a second batch of one kit so I could wear it to class. It’s gorgeous. I made 14 kits — each one filled with Swarovksi crystals and Swarovski pearls, and each one different. To round out my own Swarovski stash, I ordered a batch of pearls and crystals from Corbeeta Beads, including some colours I’d never seen before. They turned out to be a lovely blend. Thanks Susan! 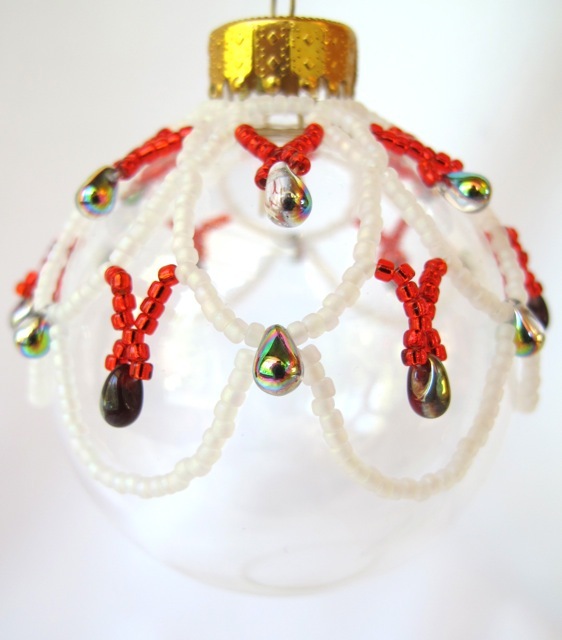 Categories: Other | Tags: beading class, beading kits, beadweaving, Swarovski | Permalink. Ladies, thread your needles! We’re gonna bead up a storm at the Sundre Library on Wednesday June 16th. This class is designed for anyone who ever wanted to try their hand at beading. After just one hour you’ll be modelling your own bracelet made of Swarovski crystals and Swarovski glass pearls. If you’re not familiar with the name, Swarovski crystals are considered to be the finest in the world — precision-cut with flash and sparkle. Swarovski crystal pearls are also beautiful. They look much like real pearls and have an added plus over other glass pearls in that they resist scratching, UV rays, perfumes and body oils. My order of crystals and pearls arrived this week and I’m having so much fun putting the class kits together. The colours are dazzling — blue zircon, hyacinth, light emerald, crystal satin, tourmaline, red topaz, light sapphire satin. It’s like Christmas in June. To see the class description, time and cost for this “Crystal Wrap” class, click here. (Click on the photo for a larger image of the bracelet.) If you’d like to sign up, please register in person at the Sundre Library.